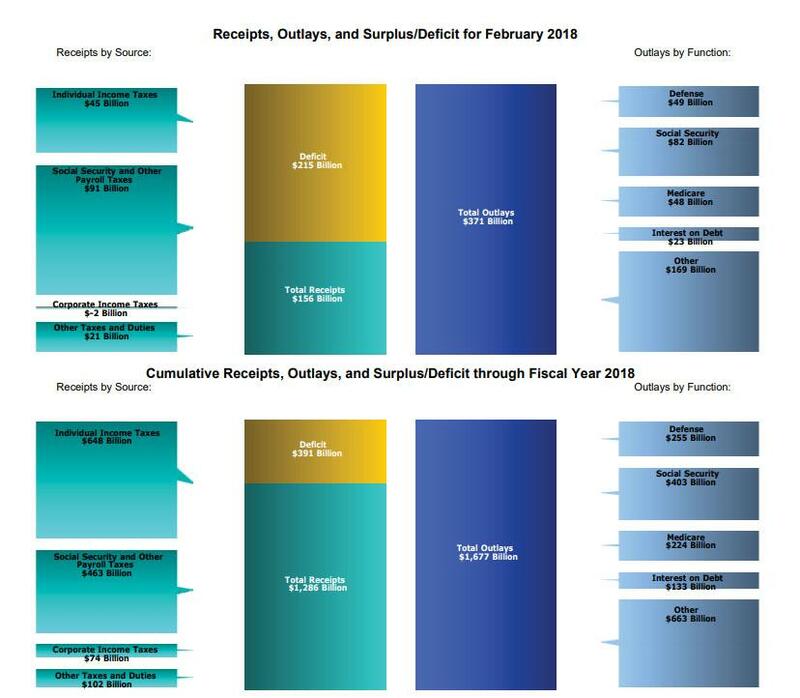 February is traditionally not a good month for the US government income statement: that's when it usually runs a steep monthly deficit as tax returns drain the Treasury's coffers. 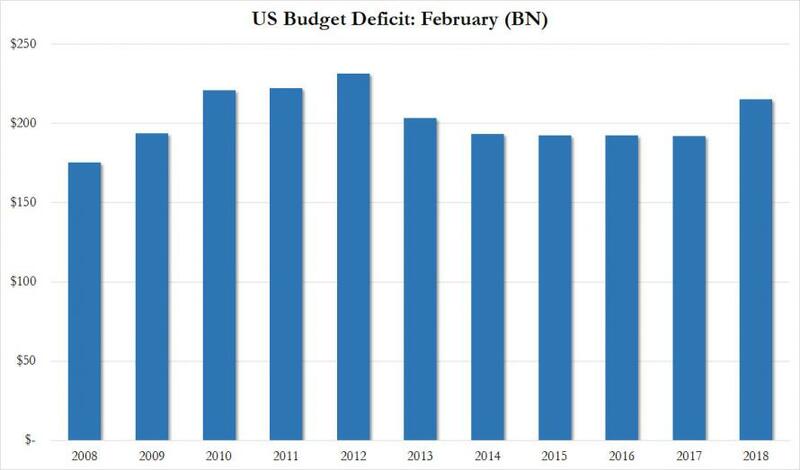 However, this February was worse than usual, because as spending rose and tax receipts slumped, the US deficit jumped to $215 billion, the biggest February deficit since 2012. According to the CBO, receipts declined by 9.4% from last year as tax refunds rose and the new withholding tables went into effect. On a rolling 12 month basis, government receipts rose only 2.1%, a clear slowdown after rising 3.1% in December after contracting as recently as March 2017. 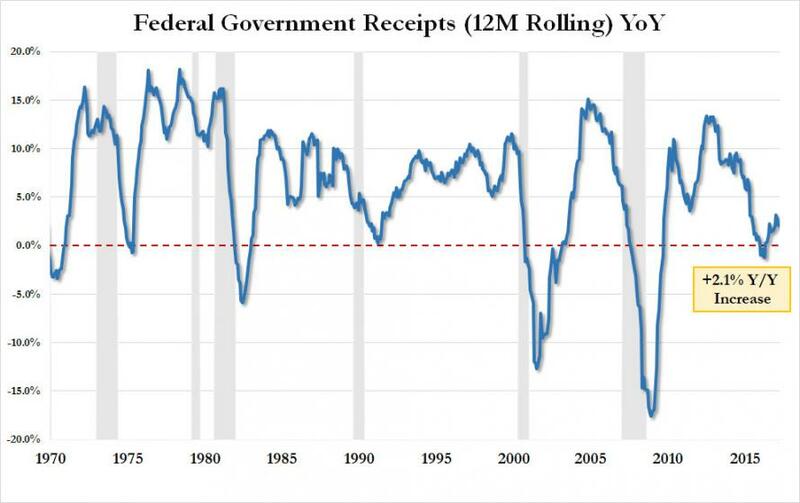 At this rate of decline, the US will post a decline in Federal Receipts by mid-2018. Outlays meanwhile rose by 2% due to higher Social Security and Medicare benefits rose and additional funds were released for disaster relief. 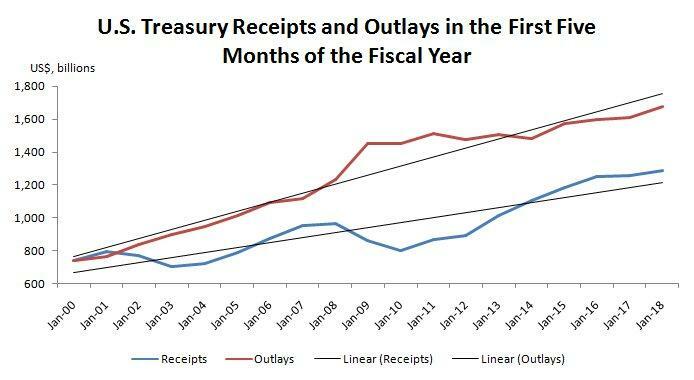 Putting these two in context, in Fiscal 2000, Treasury receipts in the Oct-Feb period were $741.8 bn, nearly matching outlays of $741.6 bn. In Fiscal 2018 meanwhile, receipts in the Oct-Feb period are $1.286 tn while outlays are $1.677 tn. Receipts are growing an average 4% per year, while outlays are rising an average 7%. Here is a snapshot of February and Fiscal YTD receipts and outlays. But most troubling was the jump in interest on the public debt, which in the month of February jumped to $28.434 billion, up 10.6% from last February and the most for any February on record. In the first five months of this fiscal year, that interest is $203.234 bn, up 8.0% y/y and the most on record for any Oct-Feb period. 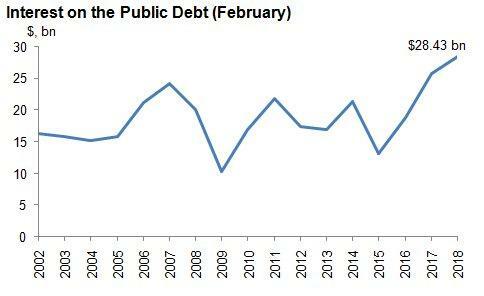 The sharp increase comes as the US public debt rapidly approaches $21 trillion. And with the effective interest rate now rising with every passing month, it is virtually assured that this number will keep rising for the months ahead.